If your sign has been damaged for this or that reason - a letter broke, the board broke, etc - we are ready to restore it for you. We can restore the damaged parts if possible or create a new sign with the old design. Illuminated letters are a wonderful way of getting visible 24/7, yet even one damaged letter can cause misunderstanding of your brand name or create a non pleasant opinion on it. We advise you replacing the non-working light with a new one thus providing the attractive look of your sign. Either it’s a neon bulb or led light, Front Signs can recover your sign with high professionalism. 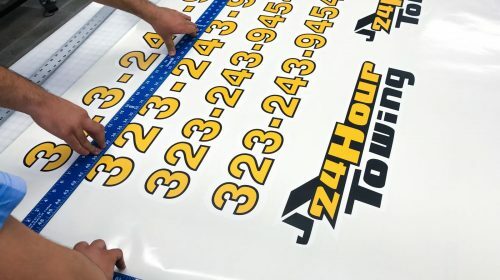 Vinyl is the main consistent part for many signs such as light boxes, traffic signs, window decals, etc. Being in the direct sunlight for a long time can result in vinyl peeling off. Either it’s on the window or on the sign, we can either replace it with another one or remove completely. If your sign has lost the paint on different parts of it or has faded, we will recover. 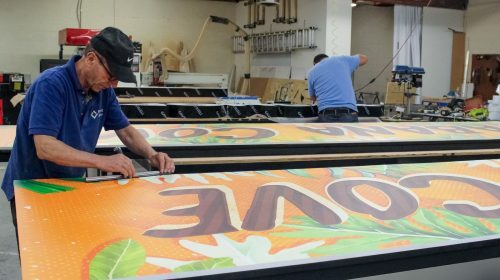 With high quality paints and professional craftsmen Front Signs will give your sign the fresh look it used to have. Signs may also be located in the wrong place or do not work well in the place they were meant to be used. If you find that your sign is not in its right place, our craftsmen can relocate it or put with another angle. Have other problems with your sign replacement, removal or recovering? Just give us a call 844-833-1188. The fresh look of the sign is one of the guarantees of your business success. We have a whole arsenal of tools in our hands ready to repair your sign in each condition. Trust your sign repairing services to us and let your fresh-looking sign work for you!